I was awakened by a very strange noise and the bedroom seemed to vibrate. Went to the window in our bedroom on the second floor and noted this huge darkish grey massive object over our homes. It was so strange I wondered what it was. The sky was blacked out but the edges were not. It occupied the space of almost the block of our homes. It was between one am and one thirty in the morning. There was this strange feeling. You just knew it was there. It hovered so low it scared me and then was gone in seconds. Something so large and yet so fast. The sound was not a rumble but like vibration with a extremely high pitched sound but not a wining noise. I knew it was a UFO immediately. I wasn’t afraid at all, in fact I attempted to see markings on the bottom surface of the object and looked at the points and sides. It just ascended and was gone. Not even a noise . It was huge! I didn’t want to tell anyone. It was just right there over us. Amazing. Not my first experience. Wondered why it was here. We live near Lake Ontario and a marshy area. I have seen things out in the lake near here as well. NOTE: The above image is a rendering. KEN’S NOTE: There has been talk in the UFO community that there is an underwater alien base in Lake Ontario. According to the internet, there’s a UFO base parked right under Lake Ontario. That’s right, fire up Ask Jeeves and search “Lake Ontario UFO base” and you’ll come across numerous references to the supposed alien hideout—like the paragraph below, from what purports to be an abridged list of all the alien bases on the planet. NOTE: The above image is a rendering. 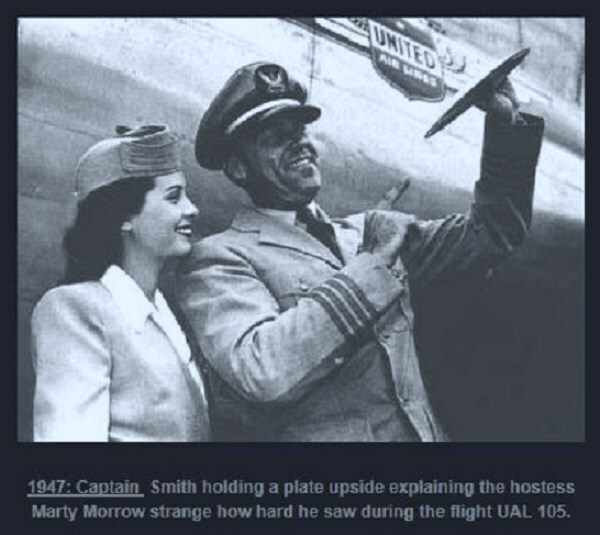 Captain Smith is a pilot of the American company United Air Lines. The staff of the company who knows years certify its reliability. On Friday, July 4, 1947 at 20:17, Smith, about to take off from Boise (Idaho) to join Seattle Washington is questioned about flying saucers. I’ll believe it when I see he replies. His flight 105 took off at 21:04 Boise. 8 minutes after takeoff, when the aircraft is at 2100 m above Emmett (Idaho), Ralph Stevens, the first officer of Smith, a phenomenon that is observed for another aircraft on approach. He lights his landing lights to indicate its presence, but gets no answer. Smith then examines the phenomenon in turn and determines that it is not only not a plane, but four other objects are now aligned and evenly spaced in the south of the first. He estimated about 30 miles away. By studying a little more to the residual glow of sunset, Smith and Stevens realized that none of the five objects have wings or tail. After calling Marty Morrow, a hostess, to have a third witness confirmation, they look at the training a little longer, sometimes call the CAA Ontario (Oregon) to obtain a confirmation from the ground, and see training darker face and disappear at high speed towards the west. Smith will insist that there was no rain phenomenon could abuse them (the objects are seen in front of a clear sky above the horizon and the area 1000 feet) and they observed objects long enough (10-12 min) to be fairly certain that it was no conventional aircraft. They seemed flat at the base, rounded at the top, and guessed some sort of rough surface on the top, although it can not refine this description. Almost immediately after losing sight of the first 5 items, a 2nd training four objects (three in a row and the fourth highest and the other right) moves in front of their position, again traveling in the direction of the west, but at a slightly higher altitude than 8,000 feet of the DC-3. They go quickly out of sight to the west at speeds that appear beyond known at the time speeds. Smith says that he was never sure about sizes or distances, but the general impression was that these devices in the form of discs were significantly larger than regular units. Smith, Kenneth Arnold, and co-pilot Ralph Stevens Smith had not taken seriously the previous accounts of newspapers using the term so persistent “Flying Saucer”. After this observation 9 unconventional aircraft without wings that evening of July 4, he will become more interested in the subject, while refusing to speculate as to their true nature or origin. The next day, Kenneth Arnold was presented to Smith. They get along well and become good friends. Arnold Smith asks for help in its investigation of Maury Island. Smith said last happy to help, and Arnold went to Seattle to bring it to Tacoma. NOTE: The above image is a rendering. WASHINGTON — Why is Lester Pearson’s 89-year-old former minister of defence coming to Washington next week to testify as to the existence — and multiple visits to Earth — of little green men (not to mention tall white dudes) from outer space? “Because this is the third most important issue facing humankind after global warming and changing the monetary system,” Paul Hellyer says. It is the eve of what is being billed as “the Citizen Hearing on Disclosure of an Extraterrestrial Presence Engaging the Human Race.” Hellyer, the former Liberal, Tory and independent MP who first sat in Parliament in 1949, will be arguing — hardly for the first time — that, as he tells me by phone from his home in Toronto, not only has ET been here, “there are more than one species, in fact there are several species. “There has been collaboration between one or more of them with the U.S. government and the U.S. defence department. They’ve been sharing technology, some of which they wouldn’t want the public to know about. Not only anti-gravity machines, but also diabolical weapons — so many things that will affect the future of humankind.” Why didn’t you ask them about this when you were minister of national defence? I ask. “I’d never heard about this at that time,” he answers. Alien intelligence, Hellyer says, “is like a scroll that opens up in both directions; it has no end, it goes on and on. There are people from other dimensions, too, and a lot of them have visited Earth and they still do. Some of them look very much like us. The species we call the Tall Whites have been seen shopping in Las Vegas.” Hellyer is not alone in his certainty that we are not alone. 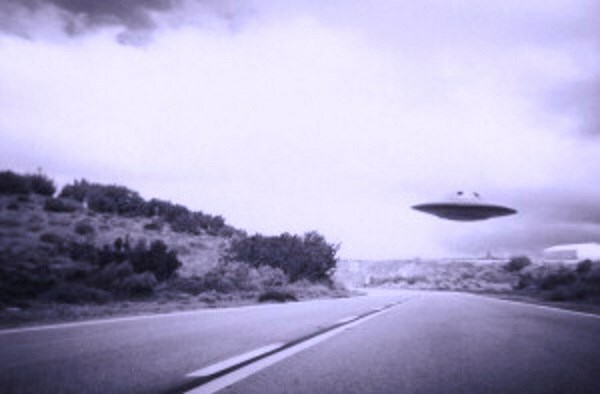 Last month, a polling firm in North Carolina sampled 1,000 Americans and discovered 21 per cent agree a UFO crash at Roswell, N.M., in 1947 was covered up by the U. S. government, and 29 per cent concur with the proposition that “aliens exist.” (When asked, “Do you believe that shape-shifting reptilian people control our world by taking on human form and gaining political power to manipulate our societies, or not?” only 88 per cent said they do not.) The Citizen Hearing on Disclosure etc., is going to occupy five full days at the National Press Club. Hellyer and dozens of other witnesses will present their opinions and their evidence to five former members of the House of Representatives plus ex-senator Mike Gravel of Alaska, the iconoclast Democrat who made a bid for the White House in 2008 but whose support never exceeded what the experts call “statistical zero.” Gravel, who is 83 and the son of emigrant Quebecers — “I have more relatives in Canada than in the United States, but they’re dying”– promises his role in the hearing will be that of an impartial auditor. 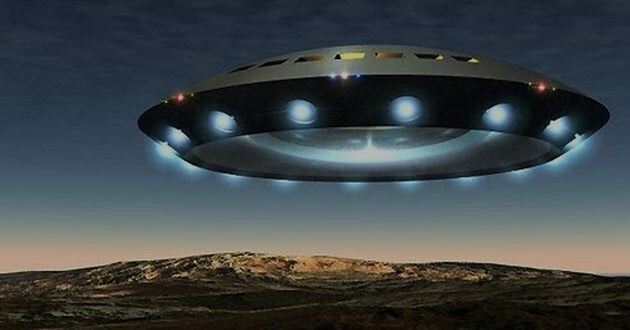 “From my point of view,” he reasons from his home in California, “the number of UFO sightings would indicate that, even if the numbers are exaggerated, they should be examined and reported to the public. France, Canada and a few of the others have revealed all the information that they have — the exception to this rule is the U.S. government. This canard that the American public would panic if there was anything proven is ridiculous. The people are mature, they understand that there are many facets of life that are unexplainable.” “Are there little green men? We’ll see what the testimony is.” What would change in our lives if they really do exist? I ask Gravel. “Nothing,” he replies. “Nothing. People would be satisfied that there are unexplained events, but that’s not unusual. The whole belief in God is empirically unproven, yet we accept that.” Both Gravel and Hellyer agree the United Nations should be involved in any further venture into intergalactic affairs. This path has been trodden before. In 1978, prime minister Eric Gairy of Grenada beseeched the UN General Assembly, “Why should man be precluded from information on UFOs, a matter of great interest and importance to man?” While Gairy was meeting with secretary general Kurt Waldheim in New York, he was overthrown by a leftist coup at home. 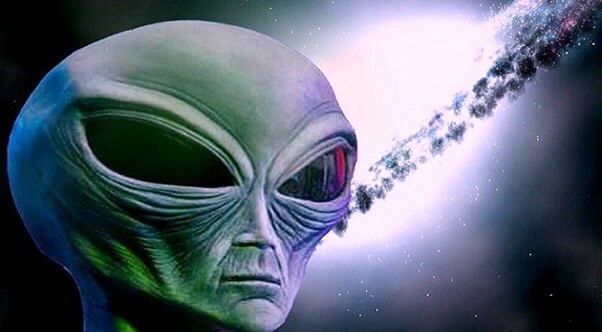 Hellyer does not believe that proof of extraterrestrial visitation would provoke, as Gravel says, “nothing.” “The ramifications are just enormous,” Hellyer affirms. “The question is, what’s the end game as far as the people are concerned who have the knowledge and are doing the engineering and building the machines that the aliens showed them that will blow your mind away? If the United States is doing these things, then Russia and China know about it and are doing the same thing. These are big issues, especially when people are starving.” Have the aliens conquered death? I wonder. “Some of the species live 900 years,” Hellyer replies. “If you read about Methuselah in the Bible, there might have been some around then. Personally, I have no desire to live 900 years. I have no desire to even live one hundred.” If you do make it to 100, will you run for your old seat in Parliament? I ask the seeker of truths. “Funny you should ask,” Hellyer says. “In one of my dreams recently, I saw myself dabbling in politics again. When I woke up, I realized that I’m really too old for that kind of strenuous living.” Allen Abel is a Brooklyn-born Canadian journalist based in Washington, D.C. Republished from the Winnipeg Free Press print edition April 27, 2013. NOTE: The above image is a rendering. It was on my birthday, I came home not long after 18:00. I noticed something in the sky, at first I thought that those were airplanes but there was no noise and they circled too long above my village. I can’t say that it was a true circle path but they were going around and around and every minute they would almost touch each other and then continue again and again. Each of them had 3 apparent lights. Those lights would go on and off , not blinking, more like fade in and fade out. The two objects were perfectly synchronized with the fade-in-fade-out of the lights. I have a Canon 40D and a Canon 70-200 2.8 IS lens. I immediately ran and started taking photos. It was much harder that I thought it would be. It was too dark, hard to focus, almost no stars, trees or clouds. Just plain dark. I tried recording a video of it but the Sony would not focus on it. I did records few seconds with a different camcorder that had manual focus (I just noticed it before they left). Anyway, I took many photos but its hard to tell what it was from them. For aprox 90 mins they were circling around the village and then suddenly they started drifting west until they were too far to see. There was also an army helicopter (pretty common in Israel) but it was flying much lower than the objects. My family was mad at me for staying outside instead of celebrating my birthday :) I’m attaching some photos from my 40D. In November and December 1980, the eastern side of Britain was experiencing a major UFO sighting wave. There were chases of UFOs by police cars near the coast, a UFO that overflew an oil rig in the North Sea, and the wave culminated in the famous events on the East Anglian coast at Rendlesham Forest. Just a month before these landings beside those NATO air bases, one of the most impressive alien abduction cases took place in the small Penninemill town of Todmorden, West Yorkshire, right in the centre of Britain’s most active window area known locally as “UFO Alley”. Police Constable Alan Godfrey was on patrol on the night of 28 November 1980. Just before dawn he drove along Burnley Road on the edge of Todmorden looking for some cows that had been reported missing. They were only found after sun-up, mysteriously relocated in a rain-soaked field without hoofmarks to indicate their passage. Giving up his nocturnal hunt, Godfrey was about to go back to base to sign off duty when he saw a large mass a few hundred yards ahead. At first, he thought it was a bus coming towards him that took workers to their jobs in town and that he knew passed about 5:00 a.m. But as he approached, he realized that it was something very strange. It was a fuzzy oval that rotated at such speed and hovered so low over the otherwise deserted highway that it was causing the bushes by the side to shake. The police officer stopped, propped onto his windscreen a pad that was in the patrol car to make sketches of any road accidents, and drew the UFO. Then there was a burst of light, and the next thing he knew he was driving his car again, further along Burnley Road, with no sign of the UFO. Godfrey turned around and examined the spot where the UFO had hovered. The road was very wet as it had rained heavily earlier in the night. But just at this one location was a circular patch where the roadway had been dried in a swirled pattern. Only when back at the police station did he realise that it was a little later than he had expected – although any missing time was probably no greater than 15 minutes from estimates later taken on site. Concerned as to possible ridicule, Godfrey at first chose not to make an official report, but changed his mind later that day when he discovered he was not alone. After breakfast that morning, a driver who had been on Burnley Road three miles further out at Cliviger reported seeing a brilliant white object and contacted Todmorden police. The time matched that of Alan Godfrey’s. Furthermore, a police patrol from an adjacent force (Halifax) had been engaged in a stakeout for stolen motorcycles on the moors of the Calder Valley and had witnessed a brilliant blue-white glow descending into the valley towards Todmorden shortly before Godfrey experienced his close encounter. Their story, when it reached Todmorden police station, formed a second match. Encouraged by this news Godfrey filed an official report, but was surprised when police chose to release the story to the local newspaper the following week. From here, UFOlogists discovered the case and a lengthy investigation was mounted by a Manchester-based UFO group. NOTE: The above image is a rendering. Thanks to www.ufocasebook.com and Jenny Randles Ufologist. We were outside playing badminton on a beautiful sunny day, it was around 7:45 in the evening. I have an injured ankle that was swollen at the time (But I was still capable for outdoor activities) and all of a sudden it felt completely soaked and tingly (My whole right ankle and foot) I didn’t want to tell my daughter in case shed worry about me. I looked up and thought I saw a plane, when it really turned out to be a cigar looking white object floating silently above the tree line. I pointed it out to my daughter, who for some reason didn’t take it seriously. I found this weird. As we were playing badminton, I kept looking at it as it floated silently and slowly above the trees. It was going SW and then suddenly I noticed it was going N. Through out the duration of this time, I was constantly looking back and forth (quite often) and when I looked up after it turned N, I realized it had disappeared. I pointed it out, once again, to my daughter who actually didn’t care and took the time to talk me into staying outside with her. This whole time, as well, I noticed our dog was acting strangely and looking at the trees it flew over. As I looked occasionally with him, I noticed two or three scaly figures walking where he was looking. I tried talking my daughter into going inside again, but she kept insisting everything was fine. Our dog started to walk in the direction, very slowly, the UFO had been flying to. My daughter called for him and as did I, but when he came my daughter suddenly became serious about it all. She told me she saw a golden orange light off in the trees coming from the N angle. However, she once again insisted we stay outside. I then accidentally hit the birdie to my car and she went to get it when she complained to me that she was feeling raindrops when it was a cloudless sky. I felt it as well. Walking back, she complained to me that she had goo on her hand, but thought it was a possibility it came from the dog. Shortly after, we went inside. I decided to call my father who is interested in UFOs. Only after when we sat down to report the incident and the time, did we realize how short time had really been throughout the sighting and being outside. My daughter and I actually argued about how long we were outside and the specific times and how we both felt we were out for hours. She decided to check the phone history to see when we had come in ( and just saying, I called my boyfriend shortly before we played as well). We realized it had to have happened over 15-20 minutes. Looking back, this gives us both shivers down our spine. NOTE: The above image is a rendering. I was travelling south on hwy. 35W, during heavy traffic approximate 6-7pm in the evening. I suddenly noticed to my right (east) a flat, black trapazoid-like shaped object (pyramid shape with the tip cut off) traveling west. It had no distinct features on it or lights. It was a black, matte (no shine) color. 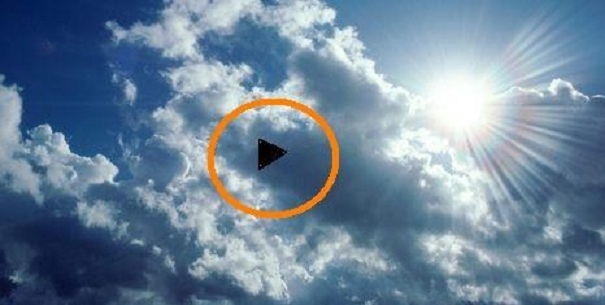 When I first saw it I asked myself if it was a bird, a kite, some sort of glider? Obviously none of those things would be flying over a major highway! I held my hand and up to my windshield to give reference to size of it. Comparably, It was about the same size. A person may have completely missed it if they hadn’t looked up from the traffic in front of them, it was traveling in-between the setting sun and darkened sky. My brain was trying to comprehend what I was seeing, not loose sight of it and make sure I didn’t run into the car in front of me. It slowly crossed all 4 south-bound lanes and 4 north-bound lanes in a straight path. I looked out my drivers-side window at that point, I saw streams of orange/red light hitting my window. ? Kept telling myself “you have to remember this! Dont freak out and forget!” I was a bit freaked by the time I arrived home, but totally thought that everyone on that highway saw it; and thus, it would be in the news. Texted all my friends to watch the news for the story. That did not happen. I never let go the the experience but wondered if I was the only one to have witnessed it that night. NOTE: The above image is a rendering. UNEXPLAINED EVENTS OF LOST TIME AND ABDUCTIONS IN LONG ISLAND NEW YORK. A woman contacted me and asked to meet with me locally in order to tell me about a very strange happening in her life about 22 years ago in the mid 1980’s. This woman was teaching in a night course in a local college at the time. Her class ended around 9pm each night. She would leave the college campus located in the Farmingdale area of Long Island and drive home the exact same way each night. It would take her about 10 minutes to arrive home. She followed this routine without deviation arriving home by about 9:15 pm. One night this woman recalls following her normal after class routine. She recalls the entire night up to the point of the nights drive home. She remembers she was about to take one of her last turns towards home, which was a rather deserted stretch of road, before hitting the last main road towards his house. Her memory fails her from this point on. Her husband started to become concerned as he waited for her that night as 10pm; then 10:30 pm came and went without any sign of his wife returning home on time. At this point he got in his car and followed the path his wife took home each night from the college. She was nowhere to be found. Concerned he returned home. He decided to wait another hour before calling the police. The woman told me that the next thing she recalls about that night is driving down the road towards home and then waking up slumped over in her car. She found herself lying across her front seat, groggy and disoriented. When she sat up and looked around she had no idea where she was. She knew it was a deserted parking lot of some kind but did not recognize it. She started her car and drove out of the lot and followed the roads until she found a main road. When she started to drive she found signs that told her she was in Far Rockaway, close to New York City, about an hour and a half away from her home. She had never been to Far Rockaway before and had to drive around until she found a highway she knew to drive back towards her hometown on Long Island. This woman told me she arrived home about midnight terrified and confused. She told her husband what had happened. She then began to vomit and feel faint. Her husband helped her to bed and noticed she had a bright red rash on her arm. She fell into bed and went into a deep sleep. The next day she woke up feeling ill and shaken. Her stomach hurt, her head hurt and she was frightened. Her husband searched the car and found what looked like something had sandpapered the back trunk section of the cars paint. He also thought the car had a very sour chemical smell inside. The woman has no recall of what happened to her that night. She knows she did nothing but try to drive home and that something interfered with her journey. To this day she has no idea what happened to her or her car that night. I found her to be a very intelligent rational woman and cannot offer her an explanation other than it fits into many other stories I have heard concerning lost time in our area. I found a man who like this woman had a similar event happen to him in one of the coastal towns of Long Island. He lived in the Islip area of Long Island that runs along the south shore coast. It is a lovely small town filled with a Main Street, schools and people living along tree lined streets. Two state parks, the coast, which runs out to the Atlantic Ocean, and a river that runs into the interior of Long Island border this area of Long Island. I always considered it a paranormal heaven as it provides a perfect set up for entry into the population yet offers cover by way of the surrounding parks and waterways. I was not surprised to find this the location of this poor mans ordeal. The man, a perfectly normal man in his early forties was driving to his house one night in 2001. 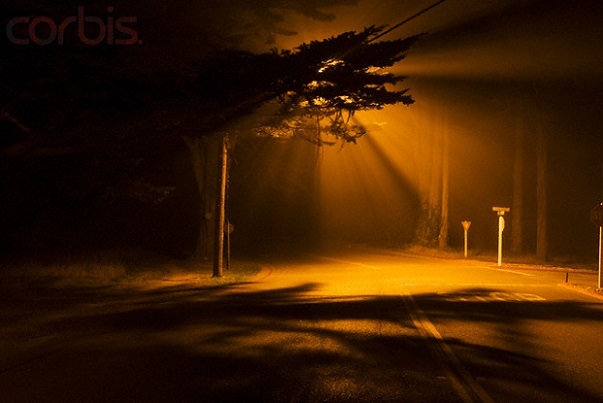 He arrived on his street and was nearly home when he noticed a cloud like bright fog ahead of him. Before he knew what was happening this fog seemed to surround his car. He stopped his vehicle to find four small beings standing in front of his car. He described them as silver gray small human like creatures with huge eyes. He has no other memory of what happened after that. He does have an extreme terror about the night that has him living with fear and trauma. The man next found himself a few hours later in the town of Lake Ronkonkoma, which is located in the middle of Long Island, about 30 minutes by car away from his street. He has no idea how he or his car got there. All he can recall is waking up on a strange street in a wooded section of Lake Ronkonkoma. He was not familiar with the area and needed to drive around for a while to figure out where he was. Eventually he found a main highway and was able to return back to his street and home. When the man arrived at his house he felt ill and exhausted and fell sound asleep until late in the morning the next day. When he awoke he had a pounding headache and backache. He also found a strange rash across his back. He checked over his car and found the paint burned on his hood. This man does not know what happened that night. He is extremely terrified by this incident and does not want his identity known. He is fearful of the area and moved to another town. He does not want to discuss this night and does not want to undergo any type of regression to bring up the memory of what happened during the missing hours. NOTE: The above image is a rendering. “I closed the truck door and pivoted to my left (now facing north) to go back in my house, when I noticed on the horizon three objects approximately 30 degrees above the horizon at an altitude of 3500 MSL (2500 AGL in this area),” the witness stated. “The objects were flying in formation with the lead craft in the middle and the other two craft approximately 1 nautical mile back and 1 nautical mile to either side of the lead craft.” The witness became startled at what he was seeing. “I am a retired pilot and the reason I was startled is that I initially stared at the lead object only due to the fact that it resembled an aircraft, especially a turbo-prop, with an engine fire. My eyes were obviously drawn to the other two craft as well and I did not know what to make of what I was seeing. 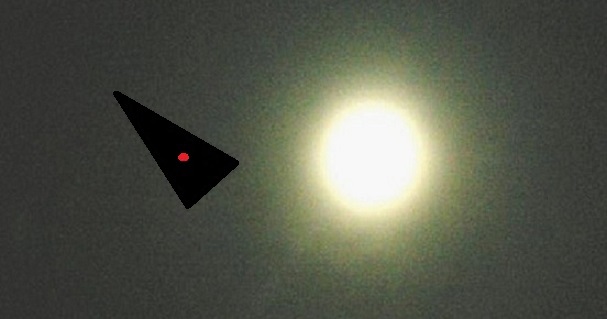 The craft were heading due west (270 degrees) making no sound.” The witness described the objects. “They resembled an orange-yellow fireball with no discernible sharp edges. 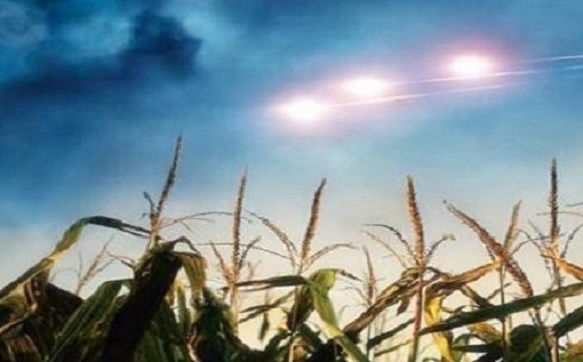 The fiery glowing light they emitted was no aircraft lighting as this light came from the entire craft. It was not light being projected onto say the fuselage or vertical stabilizer as pilots turn on below 10,000 feet when landing to light the logo or name on an airplane. These were independent craft and not one solid object as I noticed stars and upper level cirrus clouds that were covering approximately 15 percent of the sky at the time of the sighting between the objects.” The witness went inside briefly to retrieve a pair of binoculars for a better look at the objects. “I do need to add that these objects were very contrasted against the night sky. There was no missing these things in the sky. I got my binoculars and when I got back outside, there was a fourth object trailing the three, completing a tetrahedron formation as the fourth craft was trailing the lead craft by approximately 5 nautical miles.” The witness then attempted to determine the speed of the objects. The witness explained his background. “I am 50 years old. I grew up flying with my father and then at the age of 17 obtained my ratings and went on to have a career in aviation with tens of thousands of hours of flight time and this is the first time in my life that I have ever looked upward and have seen something I cannot explain. I have seen every type of aircraft fly, both military and civilian, so I had to write.” The witness says he was shook up by the incident. “I’m really kind of shook up by this. I just was asked by someone the other day if I had ever seen anything whenever I was flying, you know, UFOs they asked. Honestly and emphatically, no. I’ve answered anyone that has ever asked me that question and I have been asked a lot. I can no longer answer no.” NOTE: The above image is a rendering. 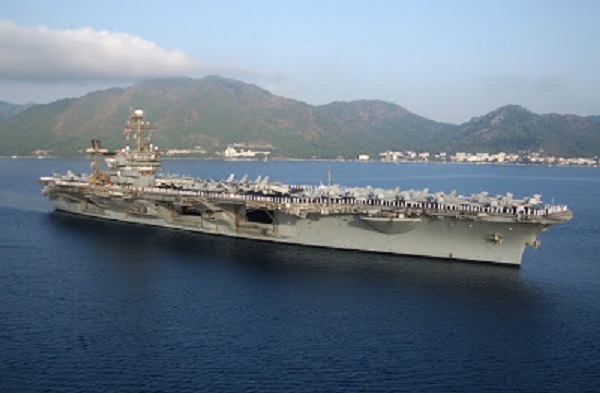 A sailor reports about the UFO sighting he had while in the Navy. 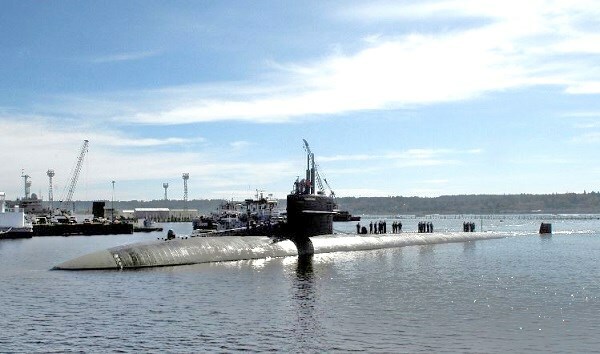 “I was assigned to USS Memphis (SSN-698), Homeport – Titusville, FL. (Cape Canaveral.) Our mission was Special Assignments which meant we protected the Space Program. We would go to sea and patrol while the shuttle was on the pad. Nine years ago, on October 24 and 25, my ship was on patrol about 150 miles of the Florida coast. We were cruising at about 500 feet when the submarine started experiencing electronics problems. The ship was malfunctioning, our tanks were blowing out of control, we were losing navigation ability and the communications area was totally lost. We went to all stop and tried to access what was happening. The controls in the reactor area started to malfunction. This presented a serious danger to our safety, so the captain ordered us to shut down the reactor, surface and go to diesel motors. When the ship surfaced I went to my watch station. The ship was still experiencing electronic difficulties but the mechanical devices such as diesel engines, cook stoves, and turbines were fine. It was raining and the entire sky was red like a red neon sign. I saw a large inverted V-shaped UFO off the port side. The executive officer told me to stand fast and he would speak to the captain. In a minute, the captain appeared on the tower and asked me for a distance to the craft. 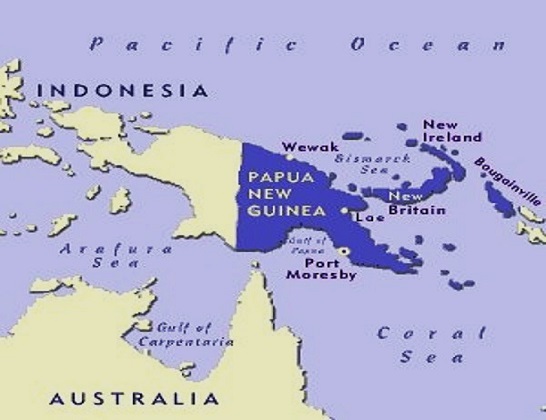 The laser range finder determined the closest point was 200 meters and the farthest point was 1,000 meters off the port. The UFO was not perpendicular to our ship but at about a 45′ angle. This huge vessel was over a half mile across. The UFO made a half circle around our ship then passed across the stern causing our electronics systems to go crazy. We had permanent damage in communications and the sonar room. As the craft flew over the stern, I could see the rain stop under its red glow. The water seemed to rise almost a foot as the UFO passed over silently. When the UFO finished its swing across the stern it paused – the sky got brighter red and it simply moved off at tremendous speed inside 15 seconds. When the UFO left our boat returned to normal with the exception of the radio and sonar. We did a quick system check and the captain ordered us to return to reactor power and get underway. My girlfriend and I, we were about to fall asleep in Huron Apartments in Mackinaw City some two weeks after the fourth of July. I made a call to the MUFON network the day after this event and was told this was probably some type of government flight path out of canada, which, looking back on the events of that night, I find impossible to believe. My girlfriend had a sudden desire to get up and smoke a cigarette. We had not been drinking and were not intoxicated. I am not religious or superstitious, nor prone to over exaggeration. We walked out to her porch, and I thought at the time, and she thought afterwards, that it was odd for her to want to just get up and smoke. It was no earlier than eleven thirty, and no later than one in the am. Within minutes of stepping out onto the porch, we both noticed a sort of wavering in the sky in the direction of the Mackinaw Bridge. The bridge towers and their position in town is very familiar to me, and it was above the towers that we saw the stars sort of waver, and then out of nowhere a pattern of very bright and obviously artificial lights began to drift to the southeast. The lights were a bluish-white, and did not twinkle or shift in luminosity. I would say there were approximately twelve lights, in equal distance from each other on the outer side of a chevron-shaped object. It sort of glided, stopped as it came above the apartment complex, and abruptly shifted towards the southeast. As it moved above us, we both felt mild stomach irritation, which I cannot say for sure was caused by the sighting, but which occurred nonetheless. (The next day my girlfriend was brought to St. Ignace hospital and treated for an unknown stomach condition). Also, I noted that the object was a pitch black, and that it reflected no light. An airplane, when it is near to the ground at night. I have seen them near Pellston Airport. The lights on this object did not illuminate the material at all. It looked entirely solid, and definitely blotted out the stars as it passed over. The entire sighting lasted less than five minutes, and just before it headed to the southeast above the apartment complex, the chevron itself sort of rotated so that the tip of the V shape pointed in the direction it was heading. It seemed to accelerate and then literally wavered out of sight. I have no idea what this object was. I have lived in Northern Michigan my entire life. I have seen as many UFOs as anyone else living around here has, all of which can be written off to something else. I am a well-reasoned person, and this is the only time in my life I have ever seen something like this. I have always laughed at people ranting about UFOs, though Ive always been interested in some of the stories. But this shook me. I have never seen anything like it. As I said, we both experienced mild nausea when looking at the object, which dissipated as soon as it vanished, but I cannot in good conscience say it was due to the object itself. Please if you have any other confirmed sightings from around this timeframe, any time in July, from this area, could you refer the witness to my email address. I would hate to die some day without having any clue about what this thing was. NOTE: The above image is a rendering. At approximately 1530 CDT on April 13, 2013, I was piloting my airplane at 2,500 while approaching the Picayune, MS VOR, heading North. Nearing the VOR, I glanced out of my right window and saw a small (approx. 10-12″ wide), shiny metallic object just off the right wing. What immediately caught my attention is that this object momentarily remained stationary with my aircraft, which was traveling at approximately 140-150 MPH. The object remained stationary long enough for me to clearly see its shape which resembled a circular or oval shaped object with what appeared to be a small. triangular shaped dorsal winglet in the center of structure. After a short (2-3 seconds)time, the object slowly drifted away to the south. It is not unusual to have close encounters with birds when flying and these, by comparison, are very fast, brief events where the bird is not much more than a flash as your plane passes. 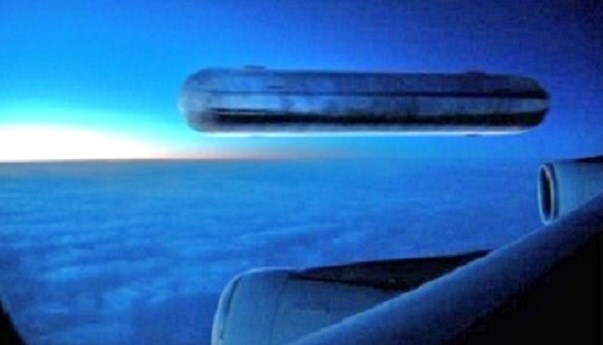 On one flight years ago, I had a shiny metallic object shoot by my airplane. It took a few seconds for my brain to recognize that this was a small mylar balloon. When I first saw this object off my wing, I immediately thought that this was another mylar balloon. But when the object did not move and remained in a stationary position relative to my wing so that I was able to make out some detail of the object, I realized that this was not some object drifting through the atmosphere. After briefly staying off the wing, the object drifted away as opposed to rapidly disappearing from view. After the object was no longer in view, I was puzzled as to what I had just seen. Since then, I have tried to understand how any object other than another aircraft could keep pace with my airplane and then drift out of view rather than appear as a flash of something near the aircraft. After giving this experience considerable thought, I thought it best to provide some type of written record of my experience. NOTE: The above image is a rendering. While in the US Navy in the summer of 1986, I was standing lookout aboard the USS Edenton ATS 1 (currently decommissioned). The lookout watch, stood outside on top the bridge of the ship, and was responsible for reporting all contacts seen both in the water and sky. It was around eleven p.m. one clear night at sea, located about fifty miles off the coast of Cape Hatteras, NC. 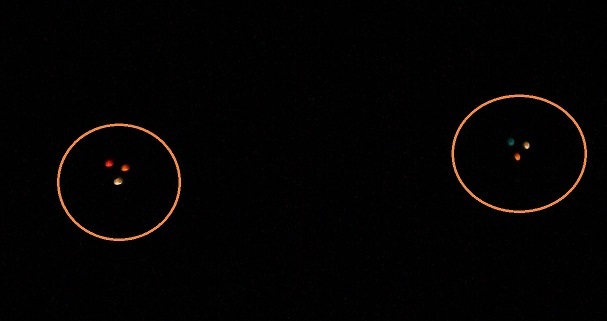 During one of my scans of the night sky, out of know where, four red circular lights appeared. The lights where hundreds of yards apart from each other and formed a square. At first, I thought it was four separate air craft, such as, military helicopters because the lights were stationary; however, due to the distance from the ship, the lights where too large to be aircraft running lights. There were also no other normal running lights like green and white, which make-up the normal outline of an aircraft seen at night. The lights where located about twenty degrees above the horizon and about a mile away from the ship. 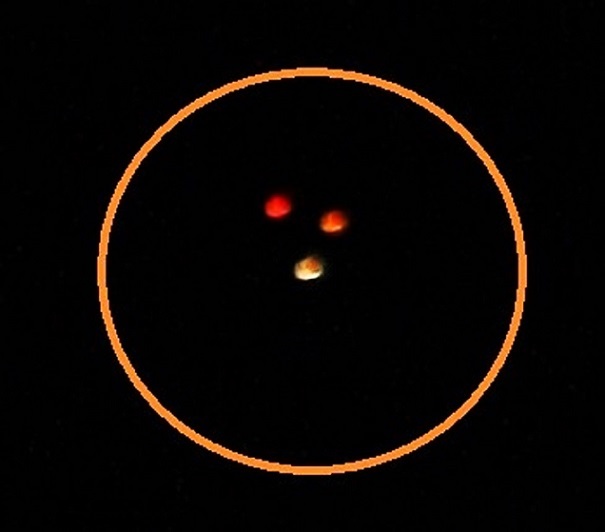 Again, these four red lights were each about the size of a small plane, which were very bright and visible in the night sky. The night sky was also clear, moon lit, and a moderate amount of stars were visible, which also aided in calculating the distance and size of these lights. As stated, when I first saw these lights they were all stationary in the sky and appeared out of know where. Once I noticed that these were not normal lights, grouped in a square and not moving, I called down to the bridge over a salt and pepper line informing the conning officer of a possible UFO sighting. This brought laughter across the wire at first, but I relayed the contact again in a stern but excited voice, which succeeded in getting the bridge officers attention. After relaying the contact information a second time, the four lights, in a flash, darted towards the horizon amazingly fast. The lower two lights in the square went first, with the top two lights following directly behind them in a curved swooshing motion and there was no sound. Then all four shot straight up into outer-space and out of sight, all within a split second. At this point, I felt very excited and shocked, and was personally praying someone on the bridge had seen what I just saw. Having been an avid watcher of the night sky, seen shooting stars and a believer in that life has to exist somewhere out there, I become even more excited because I knew, I just saw my first unidentified flying object(s). To my amazement, when I returned to the bridge after my watch, I was very pleased to learn that the conning officer and everyone else on the bridge had seen this sighting and logged it into the ship’s log as a UFO sighting. Next, after a half hour had passed since the sighting, the radiation detection system (gamma roentgen meter) on the bridge started making a loud clicking sound. At first, no one seemed to know what was making this sound then a very loud bell went off notifying us as to what was going on, we were being radiated. When the instrument stopped clicking, it indicated we had taken a hit of 385 roentgens in the period of about one minute. At this point, the captain of the ship was awoken and called to the bridge, as well as the chief in charge of the radiation metering equipment onboard ship. The captain was not impressed with an entry of a UFO sighting being placed in the ship’s log, and at first, took the roentgen meter as being defective. However, the chief informed the captain that the meter had been serviced and calibrated the day before and that other like meters throughout the ship had just gone off indicating the same amount of roentgens received as the bridge. The captain stated not to log the instance concerning the radiation exposure and left the bridge. During the rest of my watch duty that night, no officer or enlisted person spoke of what happened, and also acted liked nothing happened. This experience, however, was etched into my memory as if it happened yesterday and I have told this story to only a few people, people who I thought would believe me. This is also the first time I have documented the events of this night. In conclusion, as an indication of the strength of gamma radiation, I and others received that night; all the personnel during the Project Trinity experiments conducted in 1945 at ground zero, only received between 1 and 6 total roentgens of gamma radiation. This leads me to believe, we traveled through the wake of radiation produced by the UFOs seen thirty minutes earlier. 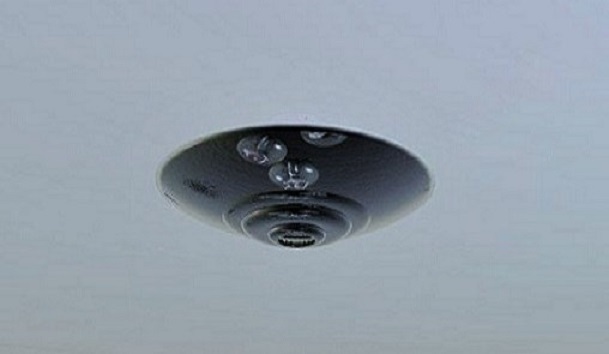 NOTE: The above UFO image is a rendering. William Gill would have one of the most celebrated UFO sightings to ever be documented, which was validated by a whole group of additional witnesses. This extraordinary event would take place at 6:45 P.M., June 26, 1959. Father Gill saw what he described as a bright white light to the Northwest. Word of the sight spread quickly, and within a few moments, Gill was joined by no less than thirty-eight additional witnesses, including Steven Moi, Ananias Rarata, and Mrs Nessle Moi. According to sworn statements, these thirty-plus individuals watched a four-legged, disc-shaped object approximately the size of 5 full moons lined up end to end. This unbelievable craft was hovering over the mission! To their utter surprise, they saw four human-like figures that seemed to be performing a kind of task. Now and then one of the figures would disappear, only to reappear in a moment or two. A blue light would shine up from the craft at what seemed to be regular intervals. The witness watched the craft and its activities for a full forty-five minutes, until the shining ship rose into the sky, and disappeared at 7:30 P.M. Glued to the sky, the witnesses would see several smaller objects appear at 8:30, and twenty minutes later, the first craft reappeared. “To our surprise the figure did the same. Ananias waved both arms over his head; then the two outside figures did the same. Ananias and myself began waving our arms, and all four seemed to wave back. There seemed no doubt that our movements were answered…” Gill and Ananias continued to occasionally wave, and their waves were returned. Another witness, Eric Kodawara, waved a torch, and there were acknowledgments from the craft. Gill went inside to eat, but when he came back, the craft was still there, only farther away (smaller). After a Church service, at 7:45, Gill again came outside to look for the craft, but clouds had appeared, and there was no sight of the object. The very next evening, the shining craft would make one more appearance. Gill counted eight of them at 6:45. At 11:20, Gill heard a loud bang on the roof of the mission. Going outside to see what had happened, he spied four UFOs in a circle around the building. These four craft were extremely high in the sky. The roof was checked for damage the next morning, but none was found. NOTE: The above image is a rendering. On November 28th 2012 at appx 6:30 p.m. my fiance and I were traveling south on hwy 139 going home. We were talking and had the radio on in our car when bright white lights caught my attention to my left as I was driving. There was a red light that flashed a couple of times as well. At first the distance of the lights was so far away over the field that I assumed it was some sort of cell phone or radio tower as it appeared to stand still in the air above the field. Then as we coninued down the highway it started moving parallel with our vehicle. I asked my fiance repeatedly “What is that” he said over and over I don’t know. He said its probably an airplane which could have been possible because of our close proximity to the army base and we see helicopters fly in and out routinly. However I thought it was strange that it had hovered for so long over the field and it seemed to be following us. I was so in awe of this craft that I came to a stop in the middle of the hwy not realizing there was a vehicle directly behind me. Luckily they saw what we were looking at but just went around us as we sat in the road and they continued down the hwy slowly. When we stopped it seemed as thou the craft stopped as well but I can’t say for sure that it came to a complete stop or if it was going so slowly that it just appeared that way. We sat in the car observing the craft for only a couple of minutes when it took off and we decided to keep up with it so we followed passing the road to our house and continuing for about 2 1/2 miles. When the craft was too far and fast for us to catch up my fiance pleaded with me to turn around and go home because we didnt have enough gas to waste driving after something that was already gone. I decided he was right when I could no longer see the craft. Plus it was dark and we weren’t entirely sure of what we saw. I turned around in a near driveway and headed back toward our rd. Right before we reached our road then on the right side we caught a glimpse of the same craft coming back. So I pulled off the road at a gravel spot directly across from our road. We watched as the craft came over the field by our road in front of us. I took out my cell phone and started to call 911 forgeting that we have no service close to where we live or anywhere near our road. I’m not sure why I was gonna call but I was starting to become alittle frightened but still in total awe as was my fiance. We couldnt take our eyes off of it because its actions were so peculuar. I did manage to use my cell phone to video brief clips of the craft when it was not so far from us. We stood with our car doors open leaning on the doors but still close enough that we could jump in the car quickly if we needed. It hovered several minutes almost directly in front of us and to be honest I believe whoever it was was watching us because while I’m trying to video record with my phone it went from a complete stop hovering in front of us to slowly flying over the top of us at such a low altitude that it frightened us back into our car. As it came upon us I could see a definate triangle shape or like boomerange shape but it absolutly had 3 points with lights and a red light that only occasionally flashed.We watched out the windows trying to see which way it was going but the lights didn’t come into view so I raised up and looked through the top of the windshield and realized that it was hovering over us. My boyfriend kept yelling at me to go, just drive but I wanted, no I had to keep watching it even though I was scared and it felt alitte surreal. It didn’t stay over us but a minute or so and when it took off it slowly continued on the slow path it was on then when not far from over us it shot off in the opposite direction like a bullet back over us and quickly out of sight. We sat a minute talking about what we had just saw and once we gathered our thoughts we left and went straight home. When I got home and finally got a cell signal and I called my dad to tell him what we experienced and he assured me that it was probably a slealth plane from my describtion and we live so close to the army base that we wanted to credit it to nothing more than an army aircraft but I have talked to people that say a stealth plane cannot hover or go forward stop abruptly, then go straight backwards. I would like to know how I could find out how I would go about getting radar records for what was in the area over hwy 139 and intersectin 164 that November evening at 6:30-6:40pm central time. I want to think that it was military but I’m afraid that it was something else and if it was army aircraft they were playing a game with my fiance and I. And if it wasn’t then it just left us with more questions. NOTE: The above image is a rendering. Lighting the fire during a cold winter evening a resident of Vladivostok found a rail-shaped metal detail which was pressed in one of the pieces of coal that the man used to heat his home. Mesmerized by his discovery, the responsible citizen decided to seek help from the scientists of Primorye region. After the metal object was studied by the leading experts the man was shocked to learn about the assumed age of his discovery. The metal detail was supposedly 300 million years old and yet the scientists suggest that it was not created by nature but was rather manufactured by someone. The question of who might have made an aluminum gear in the dawn of time remains unanswered. Nowadays, finding a strange artifact in coal is a relatively frequent occurrence. The first discovery of this sort was made in 1851 when the workers in one of the Massachusetts mines extracted a zinc silver-incrusted vase from a block of unmined coal which dated all the way back to the Cambrian era which was approximately 500 million years ago. Sixty one years later, American scientists from Oklahoma discovered an iron pot which was pressed into a piece of coal aged 312 million years old. Then, in 1974, an aluminum assembly part of unknown origin was found in a sandstone quarry in Romania. Reminiscent of a hammer or a support leg of a spacecraft “Apollo”, the piece dated back to the Jurassic era and could not have been manufactured by a human. All of these discoveries not only puzzled the experts but also undermined the most fundamental doctrines of modern science. The metal detail which was recently found by Vladivostok resident is yet another discovery which perplexed the scientists. The coal in which the metal object was pressed was delivered to Primorye from Chernogorodskiy mines of Khakasia region. Knowing that the coal deposits of this region date 300 million years back, Russian experts inferred that the metal detail found in these deposits must be an age-mate of the coal. When geologists broke the piece of coal in which the metal object was pressed into and spot-treated in with special chemical agents, it turned out that the metal detail was unusually light and soft. 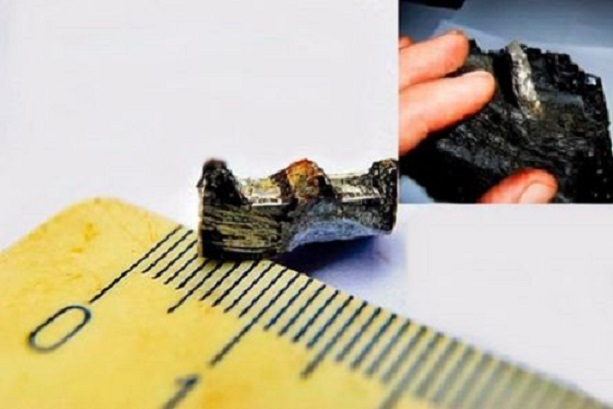 No more than seven centimeters long, the object was found to be composed of 98 percent aluminum and 2 percent magnesium. On the one hand, such an alloy stalled the scientists because nearly pure aluminum is very rarely found in nature. Thus, the detail was most definitely created artificially. On the other hand, however, when it became clear that the object was made from aluminum-magnesium alloy the experts quickly found an answer to the question of how a metal detail could withstand the ravages of time so well. The scientists explained that pure aluminum is increasingly prone to oxidization which contributes to the creation of a special layer protecting it from further corrosion. As a result, the metal detail made 98 percent from aluminum can endure not only high pressure but also heat and other severe natural conditions. Another question that interests Russian scientists is whether the aluminum alloy is of Earthly origin. It is known from the study of meteorites that there exists extra-terrestrial aluminum-26 which subsequently breaks down to magnesium-26. The presence of 2 percent of magnesium in the alloy might well point to the alien origin of the aluminum detail. Nonetheless, further testing is needed to confirm this hypothesis. The last property of the object that puzzled the scientists was its distinctive shape which was reminiscent of a modern tooth-wheel. It is hard to imagine that an object could take regular shape of a tooth-wheel with six identical ‘teeth’ naturally. Moreover, the intervals between the ‘teeth’ of the gear are curiously large in relation to the size of the ‘teeth’ themselves which might mean that the detail was a part of a complicated mechanism. Nowadays, such ‘spare parts’ are used in construction of microscopes and other mechanical appliances. This poses yet another unanswerable question to the modern scientists: how can the metal tooth-wheel be 300 million years old if the regular-shaped ‘wheel’ itself was created by man millions of years later. KENS NOTE: I personally feel this earth has been here for billions of years and countless thousands of modern civilizations have come and gone from this earth. We are digging up item like this all over the world. When will it be out time to go is the question. It was just a few minutes before midnight on January 28, 1953, when a message flashed into Wright-Patterson for Project Blue Book. It was sent “Operational Immediate,” so it had priority handling; I was reading it by 12:30 A.M… A pilot had chased a UFO. The report didn’t have many details but it did sound good. It gave the pilot’s name and said that he could be reached at Moody AFB. I put in a long distance call, found the pilot, and flipped on my recorder so that I could get his story word for word. He told me that he had been flying an F-86 on a “round robin” navigation flight from Moody AFB to Lawson AFB to Robins AFB, then back to Moody – all in Georgia. At exactly nine thirty five he was at 6,000 feet, heading toward Lawson AFB on the first leg of his flight. He remembered that he had just looked down and had seen the lights of Albany, Georgia; then he’d looked up again and seen this bright white light at “ten o’clock high.” It was an unusually bright light, and he said that he thought this was why it was so noticeable among the stars. He flew on for a few minutes watching it as he passed over Albany. He decided that it must be an extremely bright star or another airplane – except it just didn’t look right. It had too much of a definitely circular shape. It was a nice night to fly and he had to get in so much time anyway, so he thought he’d try to get a little closer to it. If it was an airplane, chances were he could close in and if it was a star, he should be able to climb up to 30,000 feet and the light shouldn’t change its relative position. He checked his oxygen supply, increased the r.p.m. of the engine, and started to climb. In three or four minutes it was obvious that he was getting above the light, and he watched it; it had moved in relation to the stars. It must be an airplane then, he’d decided – an airplane so far away that he couldn’t see its red and green wing tip lights. 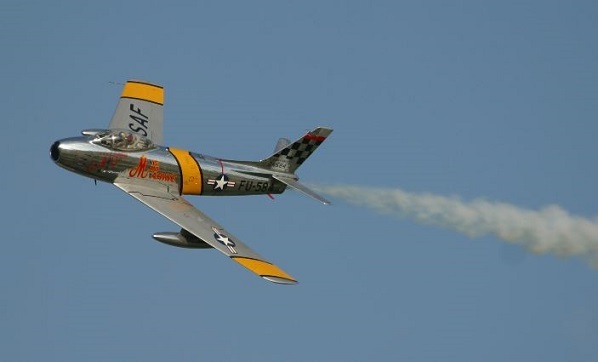 Since he’d gone this far, he decided that he’d get closer and make sure it was an airplane; so he dropped the nose of the F-86 and started down. As the needle on the machmeter nudged the red line, he saw that he was getting closer because the light was getting bigger, but still he couldn’t see any lights other than the one big white one. Then it wasn’t white any longer; it was changing color. In about a two second cycle it changed from white to red, then back to white again. It went through this cycle two or three times, and then before he could realize what was going on, he told me, the light changed in shape to a perfect triangle. Then it split into two triangles, one above the other. By this time he had leveled off and wasn’t closing in any more. In a flash the whole thing was gone. He used the old standard description for a disappearing UFO: “It was just like someone turning off a light – it’s there, then it’s gone.” I asked him what he thought he’d seen. He’d thought about flying saucers, he said, but he “just couldn’t swallow those stories.” He thought he had a case of vertigo and the more he thought about it, the surer he was that this was the answer. He’d felt pretty foolish, he told me, and he was glad that he was alone. Up ahead he saw the sprawling lights of Fort Benning and Lawson AFB, his turning point on the flight, and he’d started to turn but then he’d checked his fuel. The climb had used up quite a bit, so he changed his mind about going to Robins AFB and started straight back to Moody. He called in to the ground station to change his flight plan, but before he could say anything the ground radio operator asked him if he’d seen a mysterious light. Well – he’d seen a light. Then the ground operator proceeded to tell him that the UFO chase had been watched on radar. First the radar had the UFO target on the scope, and it was a UFO because it was traveling much too slowly to be an airplane. Then the radar operators saw the F-86 approach, climb, and make a shallow dive toward the UFO. At first the F-86 had closed in on the UFO, but then the UFO had speeded up just enough to maintain a comfortable lead. This went on for two or three minutes; then it had moved off the scope at a terrific speed. NOTE: The above triangle image is a rendering. I was on a US air flight 2646 from Austin, Texas to Charlotte, North Carolina arriving around 3:00 pm on April 5th. As we made final descent to Charlotte Douglas Airport, I was looking out my window when I observed an unusual object that caught my eye. We were roughly 200 feet from the ground when the incident occurred. I was looking down at the cars on the streets and people in their yards when a fast moving cigar-shape object that appeared to be 6-10 ft. in length flew past the plane going the opposite direction that the plane was traveling. It looked like it was leaving the airport and passing us. The object was between the plane and the tree tops, so I was looking down on it at a 45 degree angle. It appeared to be cigar-shaped with greyish dark dull exterior tapering slightly toward the ends of it. I followed it with my eyes with my forehead pressed against the window. I strained to see it as it disappeared out of view to the rear of the aircraft and was eventually blocked by the depth of the plane window. It appeared to be moving very fast and I tracked it only a couple of seconds before it zipped out of view. 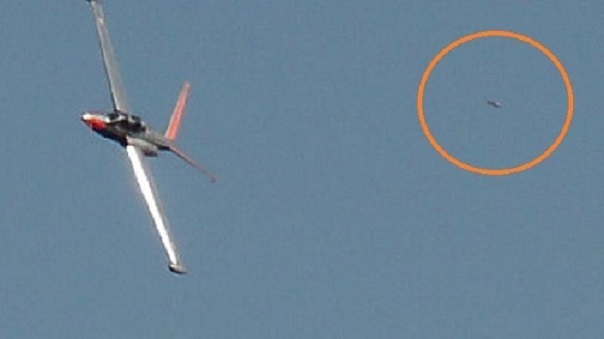 Even though the object was traveling in a straight horizontal path, it seemed to begin to ascend a short distance after it passed the rear of the plane. I am a non-believer in these sorts of matters. I only report this out of curiosity of what it was I saw. I thought maybe a balloon used for air direction, but I saw no visible tethers on the object and I thought wind indicators would have bright colors to make them visible to pilots. This was dull color and moving at fast rate of speed. I googled such balloons but found nothing like what I saw. I thought if it was a toy floating then flying it near landing planes would be dangerous to the airplane. There were no exterior features like fins or markings. I waited until my trip was over to reflect on and finally write what I saw. Curious if it could have been an everyday item that I mistook for a strange object. Perhaps a pilot or someone who lives in the neighborhoods near Charlotte Airport could explain what it was I saw. NOTE: The above image is a rendering. I was on duty in the communications center. My task was to monitor eight teletypes printing the “Fleet Broadcasts”. On the top row were four teletypes each printing messages from four different channels. On the bottom row were four more doing the exact same thing except the signal was carried on different frequencies. If one of the primary receivers started taking “hits” I would be able to retrieve the message from the bottom one. I also notified Facilities Control of any hits so they could tune the receivers. On the other side of the compartment(room) was the NAVCOMMOPNET (Naval Communications Operations Network). This was the Ship to Shore circuit with the top teletype being the receive and the bottom as the send (known as a duplex circuit). Next to this was the Task Group Circuit for ship to ship communications (task group operations or TGO). Being young and excited about my visit home and going to the Med, I completely forgot about it until years later when my wife and I went to see “Close Encounters of the Third Kind” at the movies when it first came out. In fact the friend that had been the radar operator was with his wife and went with us. As we walked across the parking lot to my car, I ask him if he remembered what We had experienced years earlier on the ship. He looked at me and said he never wanted to talk about it again. As he said it he turned a little pale. I never talked about the incident again. When I discovered “Aliens and Strange Phenomenon” on MSN and started reading the posts I started thinking about it again. Now I seem obsessed in finding out all I can about this phenomena. 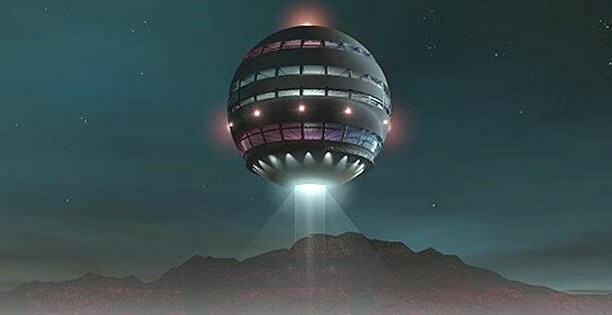 NOTE: The above UFO image is a rendering. Just before dawn, police officer Robert Dickerson was cruising the city streets in his patrol car when he noticed a bright falling object like a meteor. But instead of “burning out,” the object took on a larger, ball-like appearance, stopped abruptly, and hovered about 200 feet above the ground. Its glow lit up juniper trees below it. 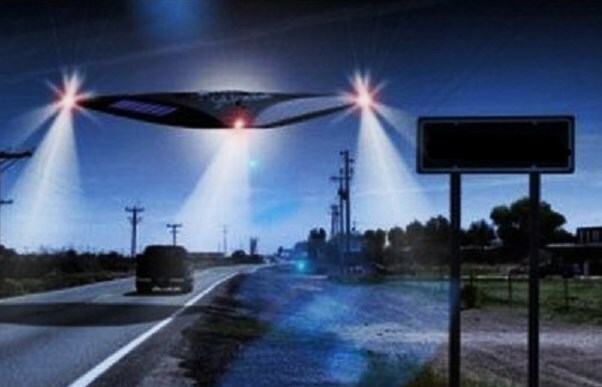 The patrolman watched the UFO for several minutes, then drove toward it on Prineville Highway, turning in at the airport. The UFO, meanwhile changed color from bright white to a duller reddish-orange color, and dived rapidly to a new position NE of the airport. The object flew over Redmond Airport, situated southeast of the city of Portland and hovered over the field, where it was observed for several minutes by FAA officials. At the FAA office, Flight Service Specialist Laverne Wertz had just completed making weather observations minutes before, and had seen nothing unusual. Now Patrolman Dickerson, Wertz, and others studied the hovering object through binoculars. The UFO was round and flat, with tongues of “flame” periodically extending from the rim. 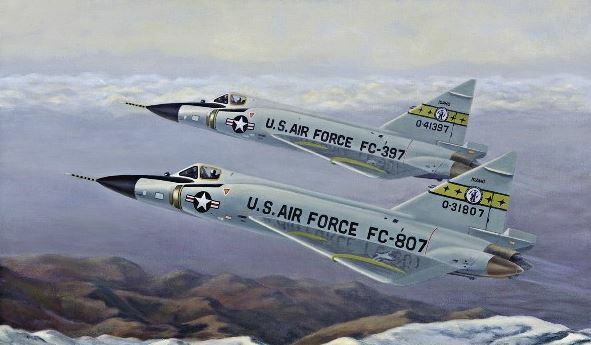 Six F-102 fighters were scrambled from Portland. As they took off, the Air Force radioed the pilots of a B-47 bomber and a F-89 fighter on routine flights nearby, ordering them to join the chase.